After playing around with the paints a bit, I decided that I am completely in love with the Pearl finishes. So gorgeous! 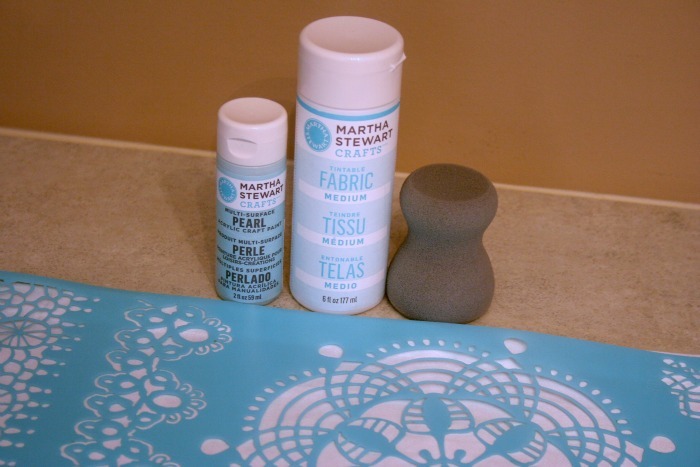 I used Jet Stream and Aquamarine Pearl Paint for this project. 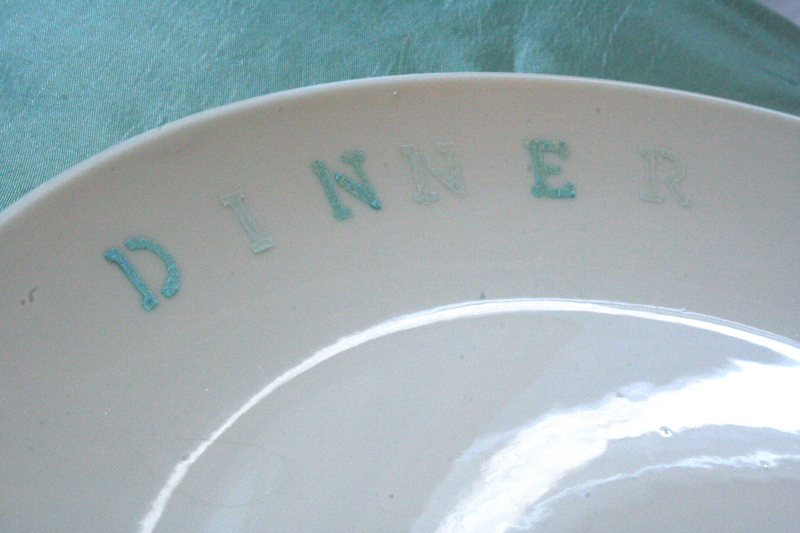 I purchased some plates at the dollar store and used the Typewriter Adhesive Stencil and the small pouncer brush to apply my paint. 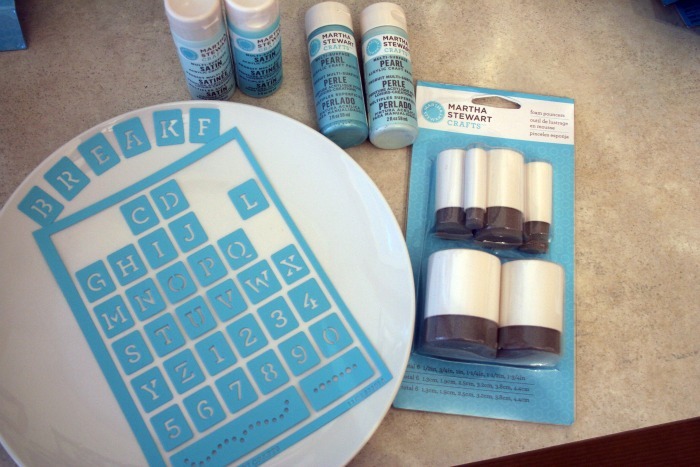 The sticker stencils are so great for glass and ceramic projects! 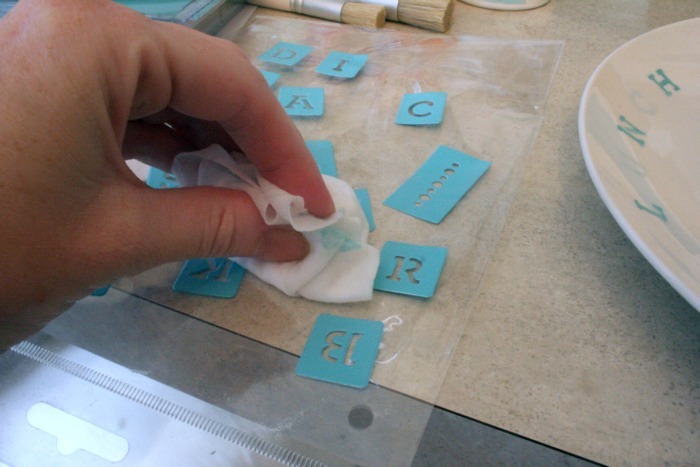 In between applications, I placed my letters on the plastic packaging material and just wiped them off with a baby wipe. Worked like a charm to ensure a clean stencil each time. Cute huh? After my paint was dry, I baked the plates in the oven to heat set the paint as directed on the packaging. 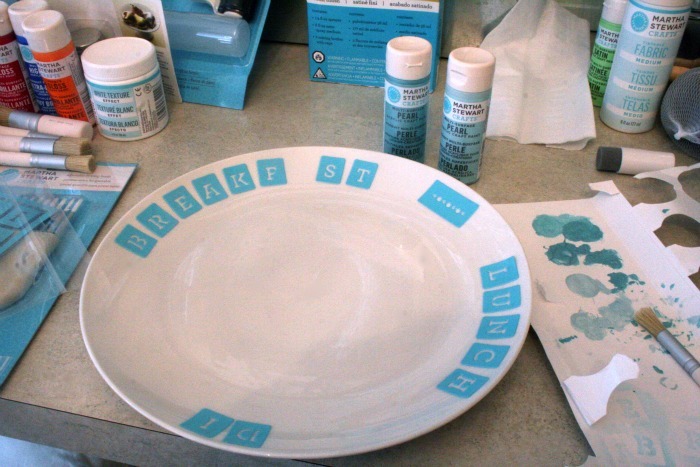 I should note that the paint is not recommended in the center of the plates if you plan on eating from them. 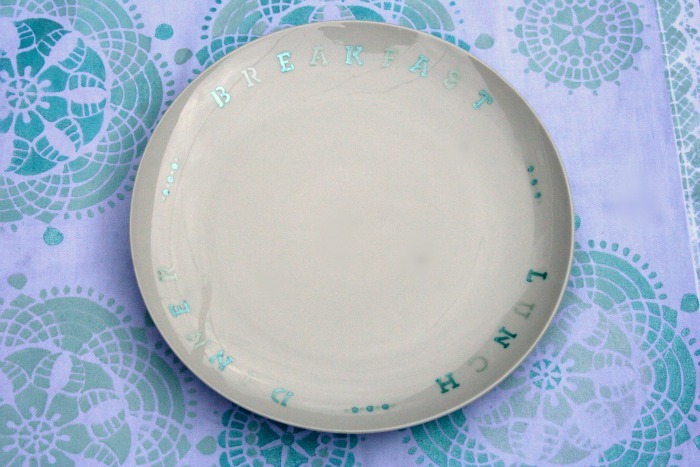 Painting the outside of ceramics and decorative plate painting is however strongly encouraged! 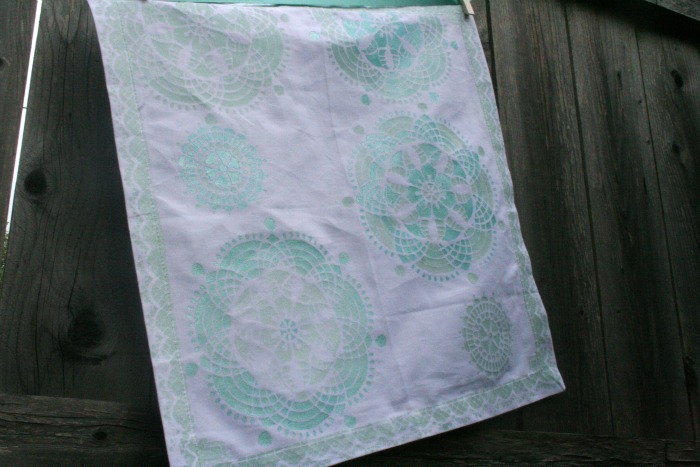 Next, I used the Cathedral Lace Stencil, large foam pouncer, and fabric medium with my paints to create gorgeous napkins! Using the two blues together really made this project come alive. Here are my napkins hanging to dry ;). It’s tricky to capture in a picture the true beauty of the Pearl sheen but the way it glitters slightly in the light is really lovely. And here is a close-up of the finished product! 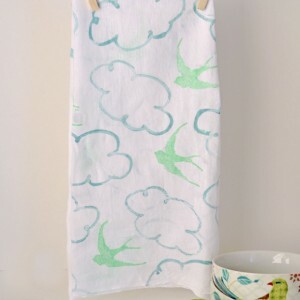 I think this would make an adorable and extremely affordable housewarming gift. But for now, I’m going to warm my own home with them :)! This post is sponsored by Martha Stewart Decorate Paint Line by Plaid. Opinions are 100% mine. Full post disclosure here. out of a possible13 and the club launched an internal inquiry. Agomoh states in the video. Use the booklets” Christ in our school. It’s perfect timing for holiday gift giving! Your table looks beautiful…I have always loved the way you style it! I hope you and your family had a wonderful summer! These are absolutely gorgeous! I love them so much!! Great use of color. And I thought I had all the crafting supplies I would ever need. Guess I best make another trip to Michaels! Lovely, the color is fab. Gotta love me some Martha. Hope you enjoyed using your new products! Love it! I was just looking for a product that could be used on ceramic. Thanks for the tutorial as usual! I adore this project! the napkins are particularly delightful! What a fun project. I love the color scheme too!! SO pretty Beth! What an outstandingly gorgeous project! These goods certainly landed in the right hands. 🙂 Love the sticker stencil idea… now that was genius. I love the stencil on the napkins. It turned out beautiful. Great job. Gotta love Michaels and MS. These turned out great and the usage possiblities are endless. Love, love, love how the napkins turned out. You did good girl! But then, you always do. Those look great! I will have to try out the new products – thanks! I love the tonal effect on the napkins. Beautiful. 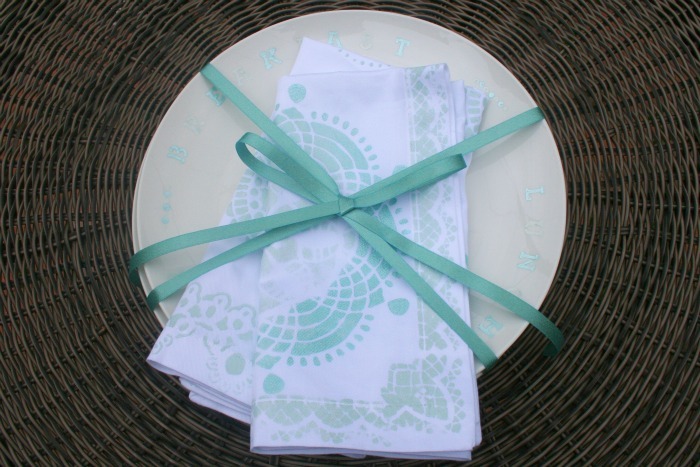 Love the design and color you used on the napkins – so pretty. 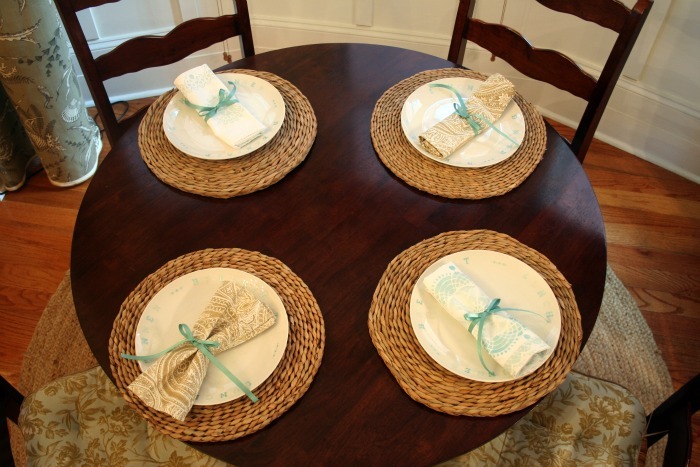 They look great against the plates and the woven placemats. Baby Wipes rock – what did we ever do without them? Hi Beth! Thanks for sharing your projects and how you did them. 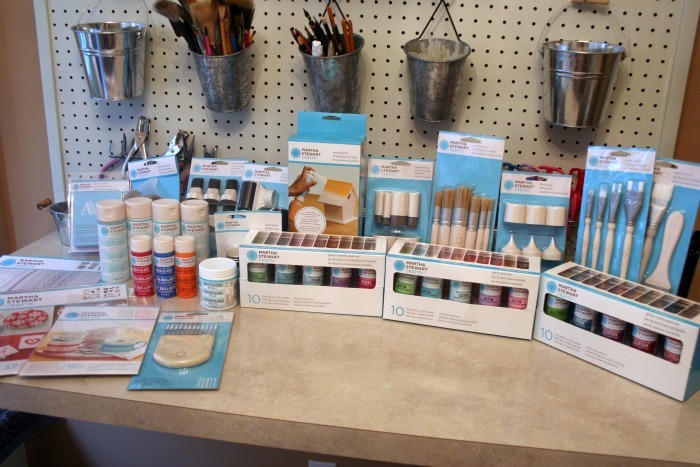 I am looking forward to my Michael’s getting in the new MS line of paints and stencils. Thank you also for the coupons! These are too cute, Beth! Such a great gift idea! Love the baby wipe tip! 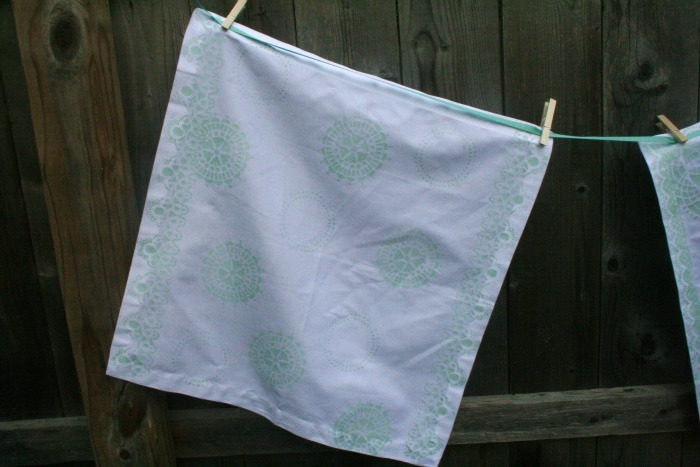 We’re waaay past baby wipes in our house for, um, babies – but I’ll grab some for stencils! Wonder if they work for spray adhesive too? Beth, I love the napkins. Great idea! 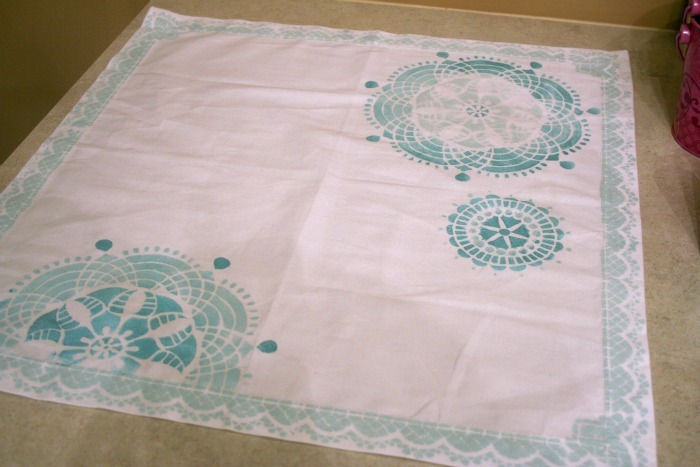 I’ve been wanting some new cloth napkins… I’m totally going to stencil my own napkins! I love all the new Martha products. They are all so versatile.